This screen is designed to display product wise purchase details. It will also display the price line and purchased quantity. 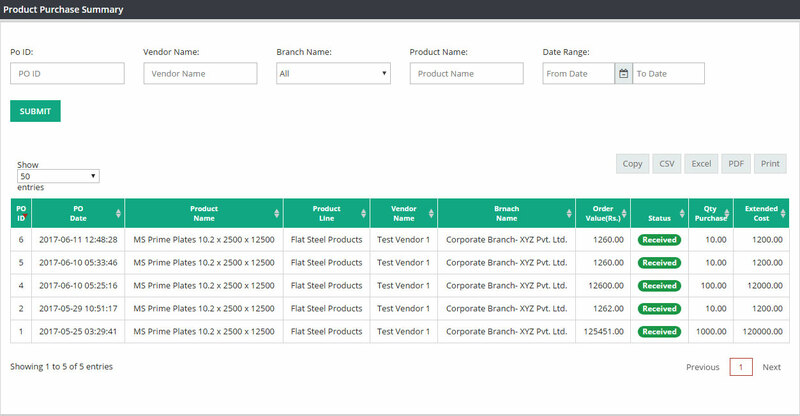 You will be able do the product purchase comparison from this screen. PO ID : Please enter the PO ID if you want to display product purchase details for a single PO else keep this filed blank. Vendor Name : Please enter the vendor name on this field if you want to see product wise purchase details for a specific vendor. Product Name : If you want to see the purchase details for any particular product, please select the product name here. Date Range : Please enter start & end date. PO Date : Day when this PO was received. Vendor Name : Name of the vendor who sold this material to you. Branch Name : Name of the receiving branch or company. Status : This screen will display the information for Received PO and Returned PO, so Status will be either received or returned. Qty. Purchased : Total quantity purchased on that PO for that product. If you want to copy, download or print the data from this screen, then please click on Copy/CSV/Excel/PDF/Print.